When Was the Bike Invented? 1817 – The Running Machine. Invented by German Baron Karl von Drais, this had no pedals no chains, but two wheels. It was propelled by pushing feet on ground. It was sometimes known as human horse. It was largely a form of entertainment for aristocratic families with their own estate. The Velocipede – 1860s. 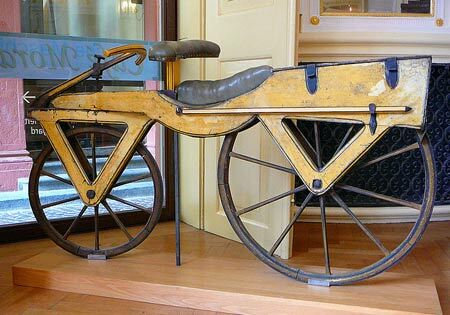 In the early 1860s, two Frenchmen Pierre Michaux and Pierre Lallement put pedals on the front wheel and introduced the velocipede, which looks more like our modern bicycle. It had no chain and was very uncomfortable due to wooden wheels. This helped the spread of the bicycle. The Penny Farthing. 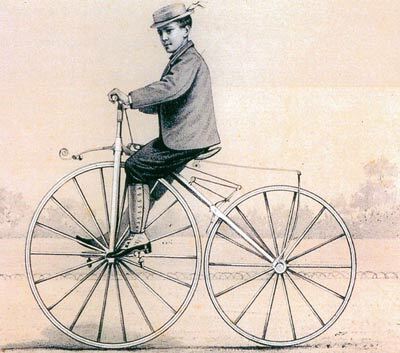 A development of the Velocipede, this was faster due to the larger diameter of the front wheel. But, considered dangerous because of height. Nevertheless the first cycle races were on these high machines. 1885. The Safety Bike. It was around the 1880s, that the first safety bikes appeared. These are considered the first real bicycles. With their standard two triangle frames, pedals and chain, the basic design has remained unchanged. Starley’s 1885 Rover is considered the first real bicycle model. The Pneumatic Tyre. In 1888, Scotsman John Dunlop invented the first practical pneumatic tyre, which created a much more enjoyable and comfortable ride. The bicycle was ready for mass participation. Henry Ford, Wright Brothers. Dunlop tyres, The Rover Cycle Company, Morris Motor Company. IS CITI BIKE IN TROUBLE?